Indiana: What do you think of her? – Joyce's mystery and fiction book reviews with some non-fiction too! Indiana: What do you think of her? This semester I am auditing a class on Adultery in 19th Century Literature. It promises to be intriguing and interesting. The first book assigned was Indiana. 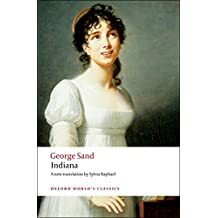 This is the first novel that George Sand, a pseudonym for a female author, wrote. The story shows the same double standards for men and women that continue to exist today. Read to learn more about what “love” and “marriage” meant during the 1800s. See who you feel empathy for and decide what you think of the ending. FYI… I will continue to talk about the readings for this class as the semester progresses. Has anyone taken a class like this? Adultery in 19th century literature…I feel so bad for you having to read such depressing books. I wonder if you’ll read Anna Karenina. I don’t think I’ve come across one 19th century book filled with adultery where everyone doesn’t end up dead or miserable. So, I wish you luck! I think that there were historic and cultural reasons for that so women’s lives often ended badly. I read some of the novels like AK when i was younger and wonder how they will seem to me now.